Call or Text for an Appointment Today! 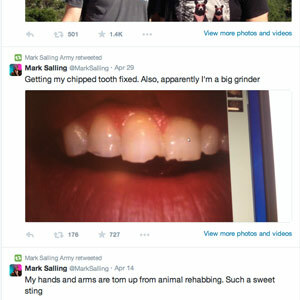 Sure, it’s big news when celebs tweet selfies from the dental office… if you’re still living in the 20th century. But in Hollywood today, it’s harder to say who hasn’t posted snaps of themselves in the dentist’s chair than who has. Yet the pictures recently uploaded to Twitter by Mark Salling, the actor and singer who regularly appears as Noah “Puck” Puckerman on the popular TV series Glee, made us sit up and take notice. “Getting my chipped tooth fixed. Also, apparently, I’m a big grinder,” read the caption. The photo showed a set of upper front teeth with visible chips on the biting surface. What’s so special about this seemingly mundane tweet? It’s a great way of bringing attention to a relatively common, but often overlooked problem: teeth clenching and grinding, also called bruxism. Although bruxism is a habit that affects scores of people, many don’t even realize they have it. That’s because the condition may only become active at night. When the teeth are unconsciously ground together, the forces they produce can wear down the enamel, cause chipping or damage to teeth or dental work (such as veneers or fillings), or even loosen a tooth! While it’s common in children under 11 years old, in adults it can be a cause for concern. Sometimes, mouth pain, soreness and visible damage alert individuals to their grinding habits; other times, a dental professional will notice the evidence of bruxism during an exam or cleaning: tooth sensitivity and telltale wear and tear on the chewing surfaces. Either way, it’s time to act. Bruxism is most often caused by stress, which can negatively impact the body in many ways. It may also result from bite problems, the overuse of stimulating substances (caffeine, alcohol, tobacco, and illegal drugs), and as a side effect of certain medications. Sometimes, simply becoming aware of the habit can help a person get it under control. Common methods of stress reduction include exercise, meditation, a warm bath or a quiet period before bedtime; these can be tried while we monitor the situation to see if the problem is going away. If stress reduction alone doesn’t do the trick, several other methods can be effective. When bruxism is caused by a minor bite problem, we can sometimes do a minor “bite adjustment” in the office. This involves removing a tiny bit of enamel from an individual tooth that is out of position, bringing it in line with the others. If it’s a more serious malocclusion, orthodontic appliances or other procedures may be recommended. When grinding is severe enough to damage teeth or dental work, we may also recommend a custom-made night guard (occlusal guard), which you put in your mouth at bedtime. Comfortable and secure, this appliance prevents your teeth from being damaged by contacting each other, and protects your jaw joints from stresses due to excessive grinding forces. Whether or not you have to smile for a living, teeth grinding can be a big problem. If you would like more information about this condition, call our office to schedule a consultation for a consultation. 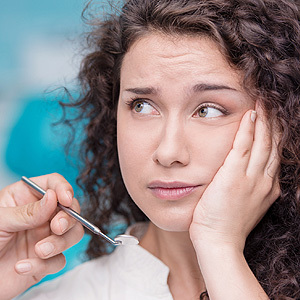 How Long Will Root Canal Treatment Last? Root canal treatment can be an effective life preserver for a heavily decayed tooth. The question a lot of people ask, though, is how long might the tooth survive after treatment. That’s an important concern since the treated tooth was in dire straits beforehand as decay had infected its inner most layer, the pulp. The infection, which had caused the living bundles of nerves, blood vessels and connective tissue within to become inflamed and diseased, was poised to invade even deeper through the root canals. During the root canal treatment, the infected pulp tissue is removed and the empty chamber and root canals are filled with a special filling to seal the tooth from further infection. The protection, though, isn’t an absolute certainty: how long a treated tooth survives depends on a number of factors. For one, the earlier a diseased tooth can be initially diagnosed — especially if the infection hasn’t spread into the jawbone — the better the procedural outcome. Likewise, the chances of longevity are also better if the initial root canal treatment was thorough in identifying and filling all the root canals as well as capping the tooth with a life-like crown in a timely manner after treatment. The type and location of the tooth can also affect its long-term health. Front teeth, with their single roots and canals are easier to access and treat. Back teeth, by contrast, can have two or more roots and a more intricate canal network. These kinds of complications could require the use of special microscopic equipment and the expertise of an endodontist, a specialist in root canals. Even if a re-infection occurs, the tooth isn’t necessarily lost. A repeat root canal treatment that addresses these and other issues, could give the tooth a “third” chance. In any case, if a tooth is worth saving attempting a root canal treatment is generally preferable to losing the tooth and replacing it with a prosthetic tooth — it’s well worth the try. Why Crowns and Bridges Are Right for You! When is a Root Canal Needed? Could Your Metal Allergy Keep You From Obtaining Dental Implants? Cemented or Screwed: Which Implant Crown Attachment is Best for You? Charcoal Toothpaste: Just a Fad, or Good Advice?